Nov. 3, 2009, 9:01 a.m.
By Martin Langeveld @MartinLangeveld Nov. 3, 2009, 9:01 a.m. The Texas Tribune lifts off this morning in Austin — there’s an election today — offering not only a slew of innovative features but also a unique content-sharing plan, by which the state’s legacy media can freely publish any content generated by the Tribune and dip into its multi-faceted information databases. Tribune CEO and editor Evan Smith took me on a tour through the site last night, showing off what he and a staff of just 16 (plus some outside help from Austin design group FlashBang) have put together in just three months of ramp-up time. Smith points out that Trib (as it tends to call itself) is not just about journalism, but about information and context. And in fact, the depth of political information already offered on the site puts to shame the offerings of many metro newspapers with vastly larger reporting, technical and design resources than the Trib. The Trib is offering all of its content as a “free syndication service” to print and broadcast media throughout Texas, as long as it’s credited to Texas Tribune. The reception of this offer, especially among the larger newspapers, has been cautious, Smith says, but has been welcomed by smaller papers without a statehouse staff of their own. The Waco Tribune-Herald has already published some Tribune content, according to Smith. Texas media will also be able to offer their readers access to Texas Tribune databases via apps they can embed on their sites. — TribWire: Inspired by TimesWire, the real-time content feed of the New York Times, TribWire is staff-curated aggregation of content from other sources. Smith calls it a “big box store” for everything you need to know about Texas politics, regardless of source. The Tribune built a custom bookmarklet for the staff’s web browsers so they can instantly post to TribWire any Texas stories they think should hit the wire. TribWire is in a prominent front-page box with a link to an expanded view. — TweetWire, the aggregated tweets of all Texas politicians who are on Twitter. The most recent tweet shows in the box, but you can click for an expanded view of recent tweets. — OurBlogs, featuring a blog by Smith, a “data blog” introducing today the Trib’s first poll, and blogs by staffers Brian Thevenot and Elise Hu. — Other blogs: aggregated content links to 25 blogs from across the political spectrum, selected by the staff. — Topic pages: Similar to The New York Times’ Times Topics, these are background pages on (initially) dozens of Texas topics, with links to related stories. It’s essentially a news wiki (something I’ve been suggesting for a while) — staff-edited for now, but with plans for public editing down the road. See, for example, the page about the Texas Education Agency, which is linked in one of today’s top stories. (For individual politicians, the topic page link goes to their directory page, see below.) The Trib doesn’t tag or label stories, which might be an additional useful way to point to topic pages. — Library, a keyword-searchable database of public documents on topics like gubernatorial appointees and lawmaker spending. The site will have 80 gigabytes of data at launch and grow from there. — Polling: The Trib plans an ongoing series of polls in partnership with the University of Texas, beginning with a poll released today looking ahead to the 2010 election. — Directory: detailed information on 242 elected officials including all statewide offices, state legislators, and the congressional delegation. Pages for individual officials show their Twitter feed (if any), their personal financial statements, contact information, election history, and detailed information about their district. The directory is available also as an iPhone app, available in free and paid. The $4.99 paid app includes extras like Google Maps of legislators’ offices, campaign contribution data, and email addresses for key office staffers. — 2010, a section where the Trib will aggregate content about the 2010 election campaign. — Calendar, a listing of all political events and fundraisers. — CampusWire, an aggregation of the best college and university journalism from around the state. — Texas Weekly, the political newsletter recently acquired by Texas Tribune, available at $250 a year. Right now, advertising is limited to a rotating spot featuring a corporate sponsor and providing a link to the donor database (which accords a variety of political office titles to contributors — Thornton is “POTUS,” I’m just a “State Representative.”) The Tribune will be aggressive in its fundraising — it has two development specialists (on a contract basis), and has hired Tanya Erlach, who has been director of The New Yorker Festival, to be its director of events. Trib events could include issue forums or debates, but the sponsorship opportunities inherent in events make them fundraising opportunities as well. POSTED Nov. 3, 2009, 9:01 a.m.
Langeveld, Martin. 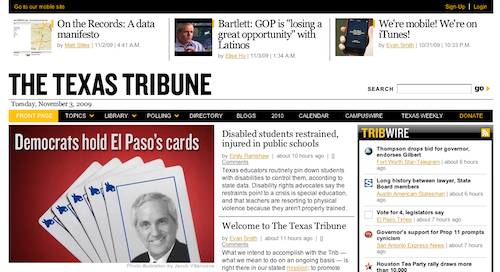 "Texas Tribune: An impressive launch that feels web-native." Nieman Journalism Lab. Nieman Foundation for Journalism at Harvard, 3 Nov. 2009. Web. 23 Apr. 2019. Langeveld, Martin. "Texas Tribune: An impressive launch that feels web-native." Nieman Journalism Lab. Last modified November 3, 2009. Accessed April 23, 2019. https://www.niemanlab.org/2009/11/texas-tribune-an-impressive-launch-that-feels-web-native/.